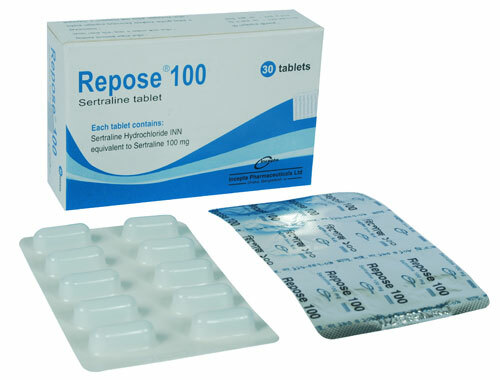 Repose 25: Each tablet contains Sertraline Hydrochloride INN equivalent to Sertraline 25 mg.
Repose 50: Each tablet contains Sertraline Hydrochloride INN equivalent to Sertraline 50 mg.
Repose 100: Each tablet contains Sertraline Hydrochloride INN equivalent to Sertraline 100 mg.
Sertraline has potent and selective inhibitory action on CNS neuronal reuptake of 5-HT resulting in increased 5-HT concentrations at the synaptic clefts, leading to facilitation of its sustained activity at the postsynaptic receptor sites. It ultimately results in an improvement of depression. Reduction of Serotonin turnover in brain by Sertraline is also another contributing fact implicated in its action. Its prolonged elimination half-life offers a benefit of once daily administration. Initially 50 mg daily, increased if necessary by increments of 50 mg over several weeks to maximum 200 mg daily. Usual maintenance dose is 50 mg daily. Child and adolescent less than 18 years are not recommended. Adult and adolescent over 13 years- Initially 50 mg daily, increased if necessary in steps of 50 mg over several weeks. Usual dose range is 50-200 mg daily. Child (6-12 years) - Initially 25 mg daily, increased to 50 mg daily after 1 week, further increased if necessary in steps of 50 mg at intervals of at least 1 week (maximum 200 mg daily). 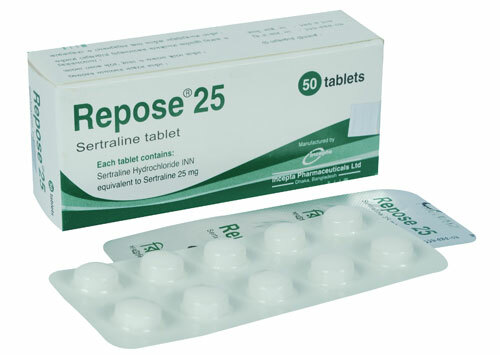 Initially 25 mg daily, increased after 1 week to 50 mg daily; if response is partial and if drug is tolerated, dose can be increased in steps of 50 mg over several weeks to maximum 200 mg daily. Child and adolescent less than 18 years are not recommended. 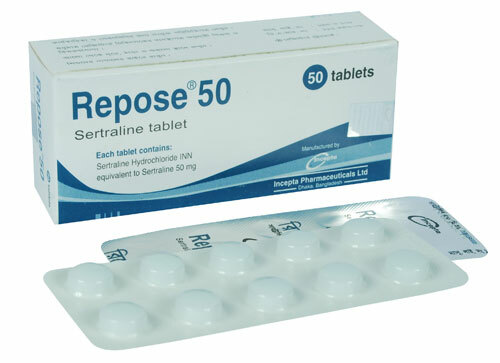 Sertraline may cause side effects like upset stomach, diarrhoea, constipation, vomiting, dry mouth, loss of appetite, weight changes, drowsiness, dizziness, headache, pain, burning or tingling in the hands or feet, excitement, sore throat etc. Precaution should be taken in case of liver problems, kidney diseases, seizures, heart problems and any allergies. This drug may cause dizziness or drowsiness. Caution should be taken in activities requiring alertness such as driving or using machinery. Caution is advised while using this product in the elderly because they may be more sensitive to the effects of the drug. Do not take this drug if you have taken monoamine oxidase inhibitor in the last five weeks. Pregnancy: Although animal studies did not provide any evidence of teratogenicity, the safety of Sertraline during human pregnancy has not been established. Lactation: Sertraline is known to be excreted in breast milk. Its effects on the nursing infant have not yet been established. If treatment with Sertraline is considered necessary, discontinuation of breast-feeding should be considered.